Before I was fortunate enough to own a kiln, I used to experiment with all kinds of polymer clay using recipes for faux gemstones. It was fun and inexpensive. While giving a fused glass lesson the other day, I said, "Hey, lets try to make some faux opals." So, we crushed up some green and orange, clear backed dichroic glass (from the Uroboros Magic Box), and mixed in a tiny bit of crushed opaque white glass. 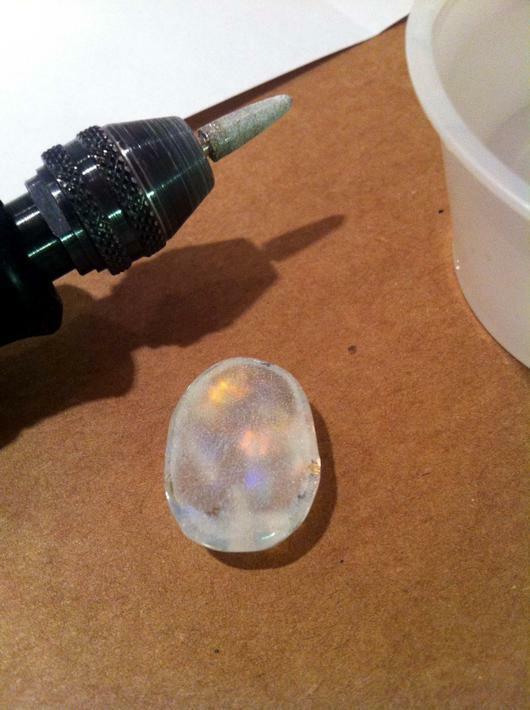 We cut two transparent ovals, covered them with Bullseye Glastac Firing Glue, and sprinkled on the frit. We added another layer of glue and piled up some more frit. The beauty of this glue is that you can use as much as you want. I love it for holding the frit on the edges of bowls and glass. 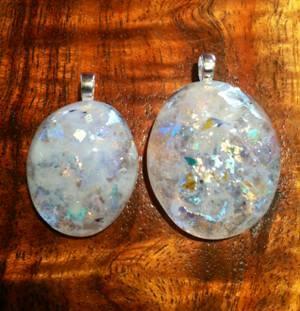 The fired pieces looked like opal cabochons! To make the cabochons more opaque, I used my Dremel tool, and ground the back sides of the glass. I did find, however, that gluing the pieces to a ring or pin blank, kind of takes the effect away. This would be an excellent tool if you were using the cabochon in a bezel, like I saw in one of the "how to" lessons, that inspired me. Adding an oval of dark green, like a doublet, behind the cabochon, might create an Australian opal effect. I have tried making a turquoise recipe using light blue, cascadia blue opal art glass, and a bit of transparent brown. Have you tried making gemstone cabochons? If so, what's your favorite recipe? Learn more about Michelle Rodriquez on her website. The views, opinions, positions or strategies expressed by the author and those providing comments are theirs alone, and do not necessarily reflect the views, opinions, positions or strategies of Delphi Glass. Delphi Glass makes no representations as to accuracy, completeness, currentness, suitability, or validity of any information in this article and will not be liable for any errors, omissions, or delays in this information or any losses, injuries, or damages arising from its display or use. Delphi Glass reserves the right to delete, edit, or alter in any manner it sees fit blog entries or comments that it, in its sole discretion, deems to be unacceptable. You must Sign in before posting a comment. Michelle Rodriquez is always cooking something up in her kiln. She, and her husband Rich, experiment with different techniques in art glass every day, and are happy to share their discoveries with other artists. As a beginner, Michelle writes about her tribulations and acheivements. Read more about Michelle here or visit her website.